I recently attended an event where I was faced with questions about my own worthiness. Could I walk into the room and remain present, be who I really am? Or would I slather on the paint of perfection? It can be seductive to make your life ‘look good’ to the rest of the world. Hiding mistakes and getting mired into the need to appear like you have it ‘all together, all the time’ is flat out trickery, both for you as well as others. The very idea that a road to perfection exists sounds more like hell than anything I have ever considered. Yet daily, I hear people fearing they did not do something perfectly, that they are not the perfect person and must continue to trudge away until they finally check off the box; Perfection. When we attempt to follow the path to perfection, a core truth emerges. We see ourselves as not worthy of love and belonging. We fear so intensely that if anyone, even those closest to us, knew who we really were, everyone would believe that we are not worth being loved. So we hide behind pretty cars, perfectly manicured houses, sweet smiles and starched dresses at church on Sunday morning. We paint the perfect picture to everyone around us, even to ourselves, in an attempt to hide the fact that we are flawed, imperfect and maybe even worse, that we struggle. It can be rather annoying as a therapist when others expect me to have the answers to every relationship question. I must have the “perfect family, perfect child and the perfect life.” Whenever I hear that, I stick out my tongue and feel like I must be swallowing vinegar. Perfectionism is an unattainable, magical place much like fairies and superheroes. Frankly, I want nothing to do with unattainable. Instead, it is healthy for us to find our way towards good enough. This does not mean relinquishing ourselves from goal setting or making plans about our future. But, if we do it with the expectation that perfection is necessary; we will inevitably be left feeling alone, unworthy and unsatisfied with our results. 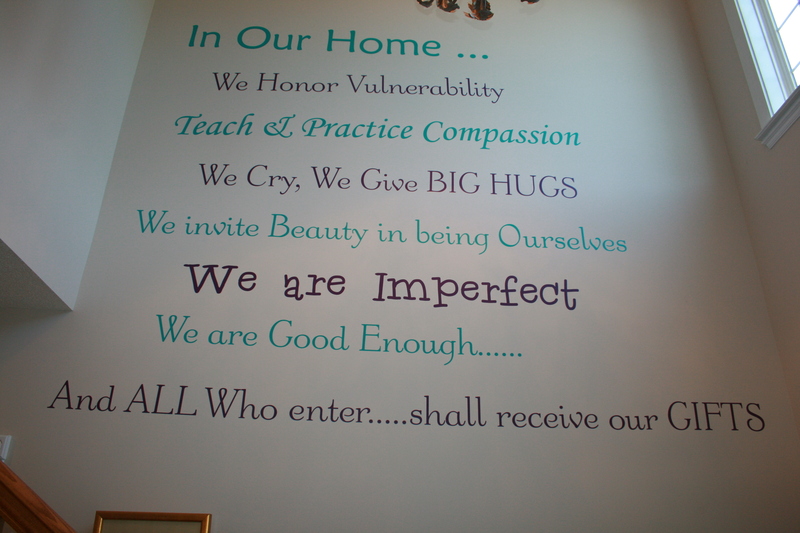 We Cry, We Give BIG HUGS……. May we each strive towards our best selves; flawed, sometimes troubled and full of struggle. You are good enough, just the way you are. You are imperfect and therefore beautiful, because you struggle, just like me. Thanks Kelly! I greatly appreciate positive feedback! !